Thanks to advancements in mobile technology, employees are increasingly performing their jobs outside the confines of their offices and driving services and productivity from wherever they might be at any given time. Although the idea of a mobile office is beneficial for most companies and employees, it is the number-one challenge for information security professionals like Eddie Borrero. As the chief information security officer at global staffing firm Robert Half, Borrero is tasked with enabling a mobile workforce, while ensuring his company’s data is protected. Robert Half and its subsidiary, Protiviti, have a workforce totaling more than 16,000 people in 19 countries, as well as a large constituency of temporary employees and consultants who work at client locations. As a result, Borrero must focus his attention on global security. Borrero’s most recent initiative at Robert Half is an employee awareness program to promote good security behavior throughout the company. Borrero admits the challenge lies with potential human error. “Technology is easy to work with. It is human behavior that is harder to predict,” Borrero says. Security awareness is particularly critical as Robert Half introduces new technologies. Moves to cutting-edge software and systems are common for big companies today, but these transitions remain a challenge from a risk-management and information-security standpoint, Borrero says. Developing and continually updating security protocols remains a constant priority. 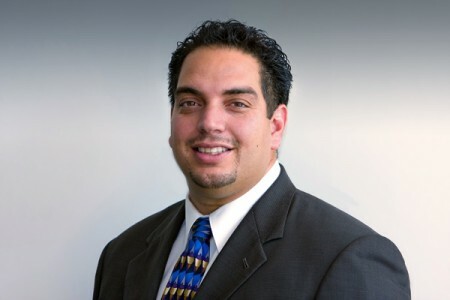 Borrero’s resume is packed with names of well-known companies such as Intuit, Electronic Arts, and PG&E. However, Borrero himself comes from humble beginnings. “It was very much a hard-knock life,” Borrero says. With a father who was struggling with addiction, Borrero often found himself bouncing from house to house in order to survive. Even when he found a place to stay, it wasn’t always the most convenient living arrangement. “Growing up in Hispanic households, we lived two to three families per household,” Borrero says. A strong work ethic is something Borrero picked up early. He would attend high school during the day and work at night. After he graduated, he joined the Navy. During his four years of service, he married his high school sweetheart. At that time, Borrero had one goal in mind: to buy a house and provide for his family. However, when Borrero’s four years in the military ended, he was left feeling confused. “It was intimidating,” he recalls. Borrero weighed his options and his skills. He had many hard skills, but after a short time installing pumps, he realized the job wasn’t for him. Borrero decided to return to school to find a career that suited him. In retrospect, he was always destined for a career in technology. “I remember buying my first computer. I ended up ripping it apart because I was so intrigued by it. I was consumed and wanted to figure it out,” he says. It was Borrero’s undergraduate thesis that would help him meet technology executives who would later help him in his career, including a position as the CIO of Intuit. Borrero’s thesis focused on low-cost ways to keep information secure, and before he knew it, he had landed a job. Borrero attributes much of his success at Robert Half to what he learned in previous jobs. Whether it was picking the brains of industry experts or being thrown into the deep end of learning new products, Borrero not only adapted but thrived. Robert Half has a number of initiatives designed to help military veterans and their families find work, including programs that help servicemen and servicewomen make the transition from the military to a corporate environment. The global staffing giant offers resources to help write resumes, network, and learn best-practices for interviews. Borrero understands how daunting the transition is from first-hand experience. Although he is not directly responsible for the company’s military veterans program, he helps where he can. “I work with our recruiters to encourage them to speak at nearby military bases,” he said. Borrero says he feels a responsibility to give back to younger generations in the Hispanic community. “I felt as if my Puerto Rican upbringing didn’t always align with people I met who had very different life experiences. I’m an example that it is possible to be successful despite challenging circumstances,” he says. Borrero and his wife make sure their children have access to all of the opportunities available to them. “I can say my 10-year-old son has done more already in his life than I did by the age of 30,” Borrero laughs.